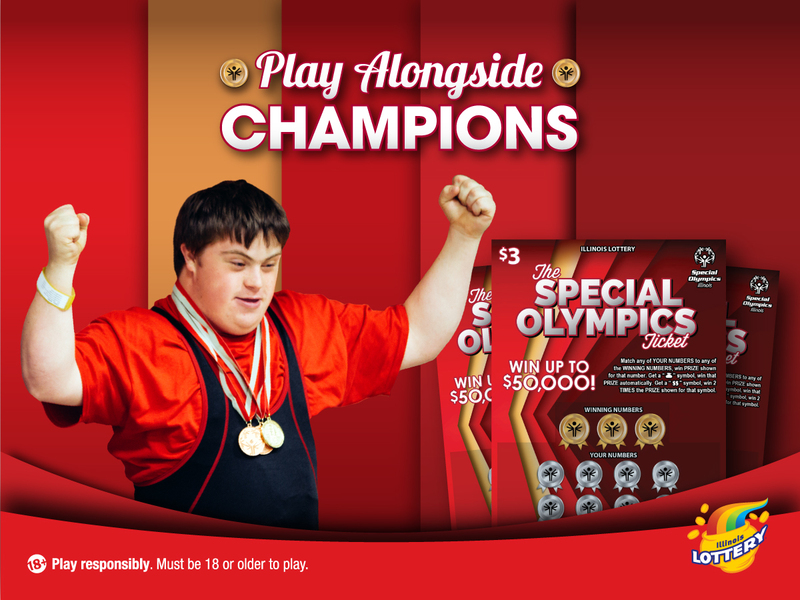 The Illinois Lottery, along with Special Olympics Illinois and Illinois Health and Human Services, unveiled the newest version of The Special Olympics Ticket – a unique lottery instant game benefiting Special Olympics sports training programs across Illinois – goes on sale Feb. 7 at nearly 8,000 retailers across Illinois. Click here to locate a participating retailer. The first-in-the-nation Special Olympics Ticket costs $3 and has raised more than $1.5 million since 2015 to benefit programs that serve over 40,000 Special Olympics athletes in Illinois. The game offers four top instant prizes of $50,000. All net proceeds, after prize payouts and expenses, benefit Special Olympics Illinois sports training programs statewide. “We are incredibly grateful to continue our relationship with the Illinois Lottery which allows Special Olympics Illinois to transform the lives of both current and future generations of Special Olympics athletes. Funds raised from the ticket will lead to further innovation and program growth, and expand opportunities for individuals with intellectual disabilities, their families and volunteers throughout Illinois,” said Dave Breen, Special Olympics Illinois President & CEO. Founded in 1974, the Illinois Lottery has contributed over $19 billion (since 1985) to the state’s Common School Fund to assist K-12 public schools, as well as hundreds of millions of dollars to the Capital Projects Fund and to special causes like Illinois Veterans services, the fight against breast cancer, MS research, Special Olympics and assistance for people living with HIV/AIDS. In addition to playing in-store, the Illinois Lottery offers online and mobile play for all draw-based Illinois Lottery games at illinoislottery.com. Players must be at least 18 years old. For more information on The Special Olympics Ticket game please visit IllinoisLottery.com.